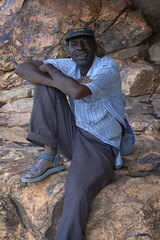 Our mountain guide, taking a rest while we enjoy the view. In Rhumsiki, when people pay for a guide, they normally get taken to tourist attractions around the village. He was surprised when we said we just wanted to climb the peak.